Fianna Fáil was a busy party in 1959. Back in government for the third time after two brief stints in Opposition, the party was on the cusp of some big changes. A younger generation of politicians were on the rise, as the older generation (some of whom had been in Cabinet for over 30 years) began to step down. Undoubtedly the most prominent of these was the Taoiseach, Éamon de Valera. Another party elder, President Seán T. O'Kelly, was nearing the end of his second term. It was decided that de Valera should become the Fianna Fáil nominee to replace him. De Valera's advancing age and identity with the last three decades of the state's history was increasingly becoming a hinderance to Fianna Fáil, which wished to contest the upcoming general election with a new face in charge. As well as this, questions were arising over de Valera's involvement with the Irish Press newspaper, which he founded and directed up to this point - simultaneous with his service as Taoiseach. In the face of this controversy and the reality of his age, de Valera reluctantly agreed to step down as Taoiseach and become the Fianna Fáil nominee for President. The question of whether de Valera would be elected unopposed for be forced to campaign for the position was quickly answered when Fine Gael nominated their previous candidate, Seán Mac Eoin. No other nominations took place, and so Ireland was faced with its first two-way presidential election. While de Valera was certainly not unassailable in this race, it was never considered likely that he would lose. This election was held along with Fianna Fáil's first referendum to introduce the First Past The Post electoral system which would have granted the party absolute majorities in future elections. The party joined the two campaigns with the slogan "Vote Yes and De Valera!" In the words of Tim Pat Coogan, the electorate instead voted No and De Valera. 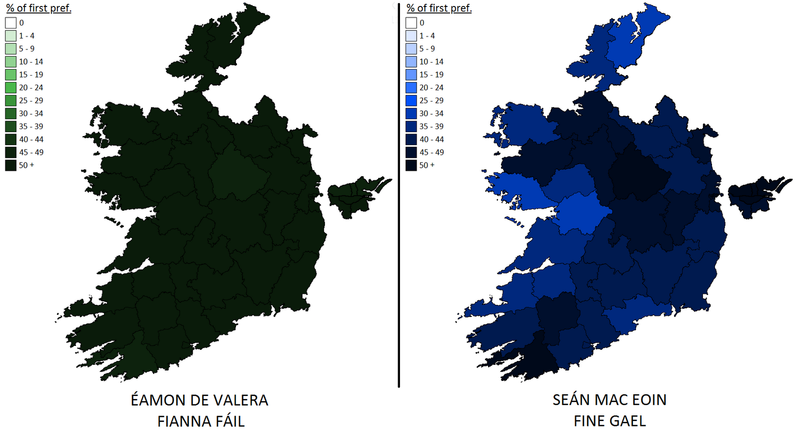 De Valera won a majority of the vote in every constituency bar the northern Dublin city constituencies, Longford-Westmeath, which Mac Eoin had represented for over ten years, and Cork West, a strong Fine Gael area. 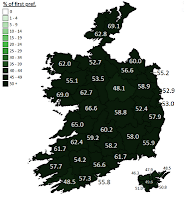 As in the previous election, Mac Eoin's best results were in the Longford and surrounding areas, with strong results also where de Valera didn't win majorities in Dublin. De Valera's vote was strongest in Clare, Galway and Donegal - his share reaching 69% in parts of the latter two counties. De Valera was accordingly elected the third President of Ireland. He had moved from the frontlines of Irish politics to what was quitely being called the "retirement home". This was not the end of his life in the political scene however, as the next decade would see him step to the forefront yet again, this time as a representative rather than a leader.